Cut resistant Dyneema gloves, EN 388 cut resistance class 5. This thin, snug fitting model offers great finger dexterity whilst keeping your hands safe from cuts. 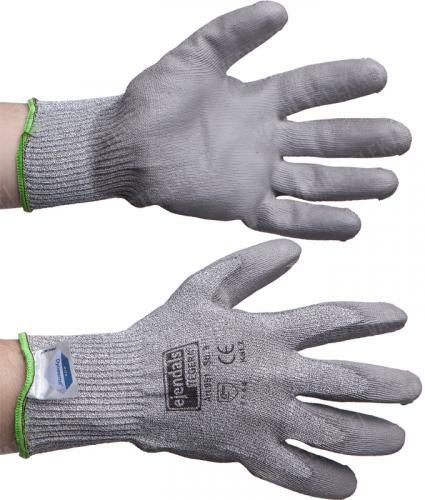 Unlike most cut resistant gloves which are made from leather, nylon and lined with some padding plus the added cut resistant layer, these are simply knitted from Dyneema yarn, making these very lightweight. You can wear these as is or as a cut resistant liner under any other gloves. Standard glove sizes, with the "easy" size in brackets. These do stretch a bit to fit the hand. If you wear a half size, we suggest opting for the smaller alternative. The "easy" size marked to the gloves themselves might differ from the one given in our listing or could be missing altogether. Our sizes are accurate and the number size is always the same as in the glove. Made by Ejendals Ab of Sweden.